JUKI MO644D is an absolute beginners delight. The only limitation of this serger is it price. Even though it is expensive, it is a value for money product. Before going to review JUKI MO644D Serger, I think the brand Juki itself needs some introduction. It is not a popular brand among Americans. Juki is a Japanese manufacturer of industrial and home sewing machines. They have their products selling in 170 countries around the world. Now, coming back to MO644D review. JUKI MO644D is a nice little, portable serger. You can easily store it away and packs some very useful features. One of the highlights of this serger is the automatic rolled hemmer.The rolled hemmer basically works by rolling the edge of a piece of fabric over itself twice to hide any fabric edges. The roll is then over sewn simultaneously as it is rolled up. The rolled hem feature has two modes with the option for stitching to either roll around the end of the hem or for a normal overlock stitch where more strength is needed. The automatic rolled hemmer provides a very neat edging for clothing, curtains, or anything you want to sew. 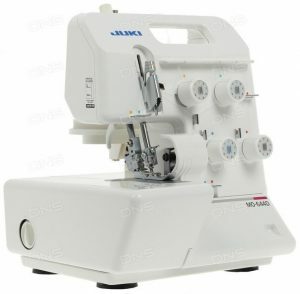 JUKI MO644D is a 2/3/4 Thread serger and the rolled hemmer adds to its versatility. You don’t need to change the needle plate or foot to engage rolled hemming, it can be done with the flip of a switch. It comes with a color coded threading system which is pretty much the standard nowadays. The thread paths are color coded and clearly marked for making threading effortless. Thread tension can be adjusted using the dials. JUKI MO644D comes with a multipurpose presser foot. It allows you to do overlock stitches and add elastic or ribbons or tape to your projects. The presser feet is snap-on type which makes it very easy to change the feet. The heavy-duty knife with dedicated drive mechanism provides consistent and effortless cutting for all types of fabric. The lower knife cutting width can be easily adjusted by turning the dial, ensuring perfect seams and rolled edges. The upper knife will move out of the way for safe and easy threading access. The differential feed mechanism can be easily adjusted by turning a dial. There is a decent lighting system on this machine. Stitch length can be adjusted using the dial. It can sew at a speed of 1500rpm. JUKI MO644D is a ‘frustration free’ serger, it really is. It is better than what you think. Some people may think ‘aaah it’s a Juki, I would have gone for it if it was a Singer or Brother’, the fact is, it is as good as any other 2/3/4 Thread serger you can get in United States. Initially, I tested it with some multiple layers of wool, the machine went through like a breeze. No issues like jamming or skipping stitches. The machine is very quiet as well, in fact it is quieter than any other serger reviewed on Sewing Machine Reviews. The overall build quality is very good and you don’t feel any vibration while operating. It is a fantastic machine for light and medium weight fabric. Most users of JUKI MO644D are beginners, which will give you some idea about the ease of use of this machine. There are some instructions to be noted before threading, so you are advised to read the user manual thoroughly. The machine comes threaded in the box. The only limitation of this serger is its price. It costs few dollars more than other sergers in the same category. However, given the ease of use and versatility on offer, it seems a very good bargain. JUKI MO644D serger is a beginners delight. As a beginner you will always look for a machine that is easy to use, MO644D is just of that kind. Even though the price is slightly on the higher side, it will be worth it. It can take all the hits and misses of a beginner. It is a lightweight machine as well.